Winter is fast approaching and fuel bills will soon be rising. The amount of heat loss through the roof can soon make those bills even higher. Now is the time to insulate your roof before the cold winter weather bites your wallet. Twistfix spray foam insulation is a very effective roof insulation which once installed will leave you with a warmer clean dry usable loft space and your winter bills will be reduced. 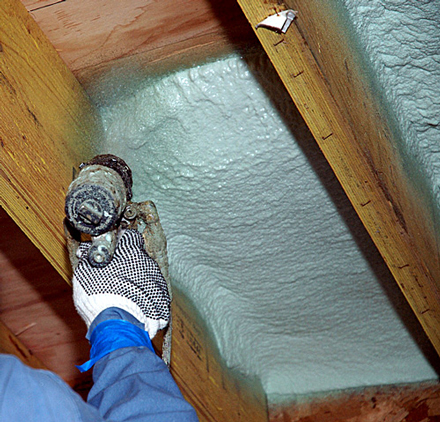 Roof Loft Spray foam Insulation is applied either to the underside of your roofing felt or if your roof is unfelted directly to the back of your slates or tiles. Not only will any existing problems be rectified (slippage of slates and wind rattle) your roof will be far stronger and more resilient to the elements. An average roof can be sprayed within one to two days! Spray Foam has several uses and also can quickly fill cracks, crevices and penetrations that lead to heat loss throughout the home. 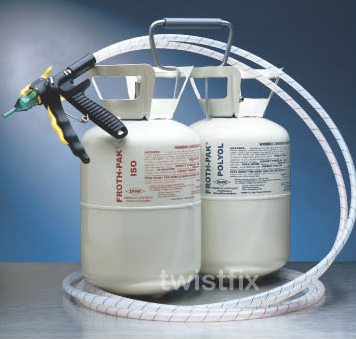 As an air sealant Spray Foam is ideal for wall/attic penetrations and electrical, mechanical and plumbing penetrations. As Insulation it is ideal for roof and wall junctures, stud wall cavities, crawl spaces in wall and ceilings and attics. People often ask “Will the spray foam pose a fire risk?” The simple answer is no as Spray foam has a Class A rating for flame spread. Does the Spray foam trap moisture in the roof timbers? No the spray foam does not absorb water; it allows water vapour to pass through the foam at the same rate as the wood itself. The kits consist of tanks, gun and nozzles and the 600 kit can be purchased as a tanks only kit. Twistfix have several products available for roof and gutter maintenance For more information contact us on 0845 123 6007 or email info@twistfix.co.uk.